We have been giving the boys a stand each year on which to display their cars. A parent has suggested we give our Webelos a multi car stand in which to display all their previous cars at their "last" race. I think it's a marvelous idea but have been unable to find a simple or cost effective plan to display 3 or more cars. We are an LDS pack so each boy only makes 3 cars. I think a plan that could be adjusted to fit 3-5 would be an amazing asset to any pack. Does anyone have suggestions or plans? For the Craftsman Pin there is a simple pedestal. 4 1/2 x 4 1/2 plate with a 2 x 2 - 4"s tall. You could make the plate bigger and have 3 to 5 - 2 x 2's all and different lengths, shortest being in front of course. Be like a stair step. Our District pushes the Derby Dome for $15 a piece. I think that's a little steep. I'm sure someone in this illustrious forum has a good idea... it's just not me right now. The one that BigTex posted may be about what you are looking for. You can always make it without the plexiglas front. I have plans posted for the one that I built my kids. You can modify it to work with fewer cars. This is what I had my scouts make. 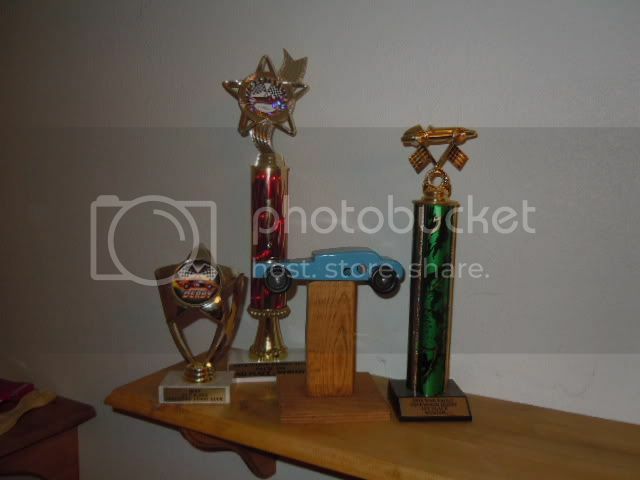 Its very simple and it sets up well with placed with trophies. I have an order out to our local trophy maker to plaques made with the boys names, etc. This was my idea about multiple car stand.